Ran out on the Trade In and it was an absolutely beautiful flat calm ride out. I haven’t had one of those in awhile so it was great, especially since we were on the center console. Unfortunately it didn’t last as we were met with a 15 knot SE wind that gave us a 3-6′ chop all day. We started out in the SW corner of the Baltimore and were able to pick some nice dolphin off of the pots at we trolled by a few of them. We also managed to get two half hearted bites from white marlin, but unfortunately they never came back looking for more. Action was kind of slow and the water was blue-green and 69 degrees which wasn’t what I was looking for, so we pushed down the line. Once we got about a mile down the line we hit the break. The water was 70.5 degrees with scattered weed and blue as could be. We had a triple of wahoo bites in 450′ of water in this area, but only one came tight. Steve was on his first ever wahoo, and we knew it was a nice one since it came crashing out of the water after the bite. 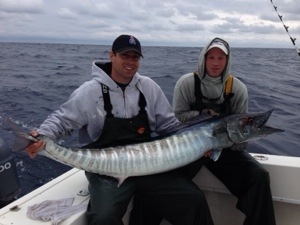 After a solid 20 minute battle, we had a nice 70# wahoo on the deck. 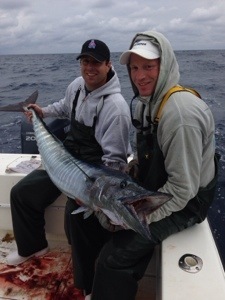 We came back around and got hooked into another wahoo that took a screaming run and unfortunately we pulled the hook. We worked the area a little longer, but the bait disappeared so we put the tuna spread back out and headed back out to 100-120 fathoms looking for longfin tuna, and sure enough, we found some bait and had a school of longfins come up. We wound up having 2 out of 7 bites stay glued and got both of them in the boat. We pounded the area hard after that, but could not get another bite. We pushed back inshore towards home and had a couple of mystery bites and another wahoo bite, but just could not come tight. It was a frustrating day as far as our hookup ratio goes, but overall it was fun and we had solid action throughout the day, so I really can’t complain. 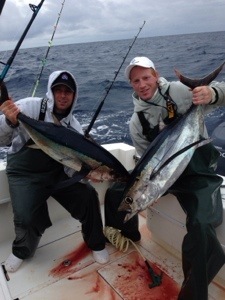 Congratulations to Steve on his first wahoo and his first longfin tuna.